Christmas Is Coming – The Site Slinger Has Got Presents for You! This Christmas we’ve prepared something really special for you. 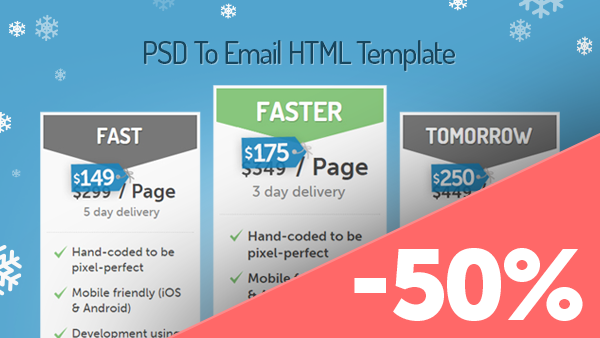 Starting from December 04 until December 25, 2014, you can order our high-level PSD to Email and PSD to responsive HTML email conversion services with a 50% discount! Do not loose this one shot! This amazing Christmas offer is available for a limited time only. The offer expires on the 25th of December, so hurry up and grab your 50% discount! Request a free quote to get started – no credit card is required! Click Here to order your outstanding PSD to Email Template. Enjoy the Holiday Season with The Site Slinger!